LHC is committed to provide high quality testing services to its customers. With the strong commitment to quality, LHC is proud recipient of the following recognitions and accreditations from various globally recognized standard bodies. NABL, a constituent board of Quality Council of India is an internationally recognized laboratory accreditation standard under aegis of Department of Science and Technology. NABL maintains its linkages with the international bodies like International Laboratory Accreditation Co-operation (ILAC) and Asia Pacific Laboratory Accreditation Co-operation (APLAC). 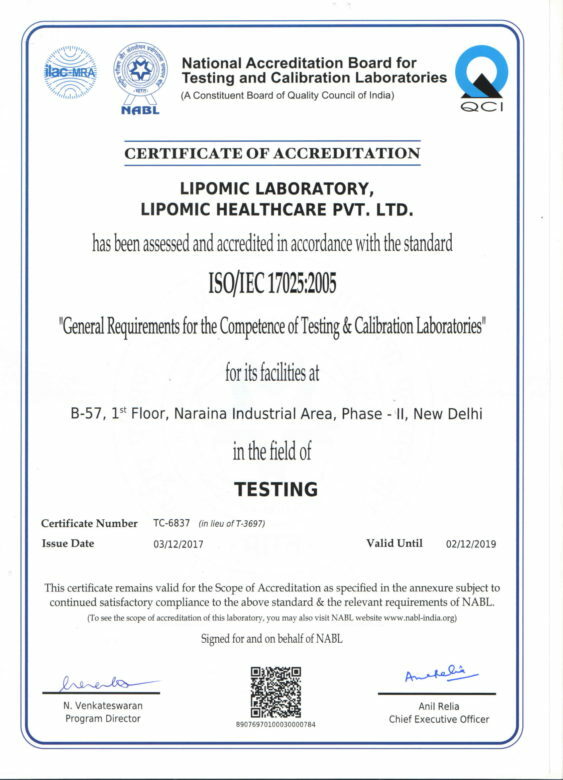 Lipomic Laboratory becomes the first NABL Accredited Indian laboratory for “Fatty acid profiling in dried blood spot samples (OMEGA HealthTest)”. LHC is engaged in innovative R & D activities for developing new products and technologies. LHC’s R&D initiatives make it possible to provide customers with the highest level of satisfaction. 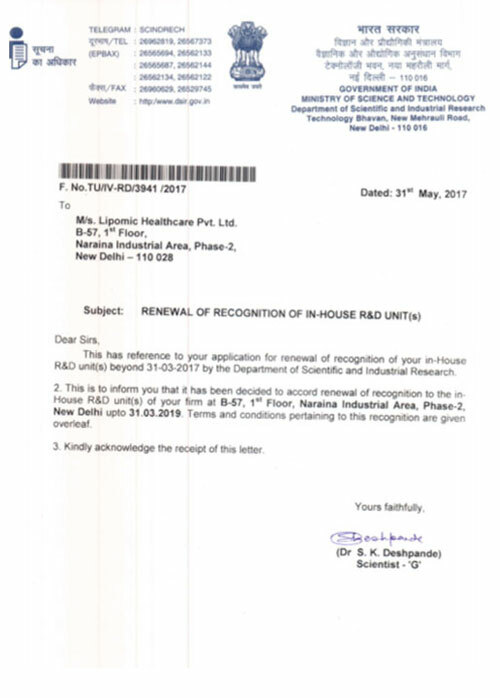 Lipomic Healthcare is a proud recipient of prestigious DSIR recognition as “Approved In-House R & D unit”..
Lipomic Healthcare is a proud recipient of ISO 13485:2016 certificate. 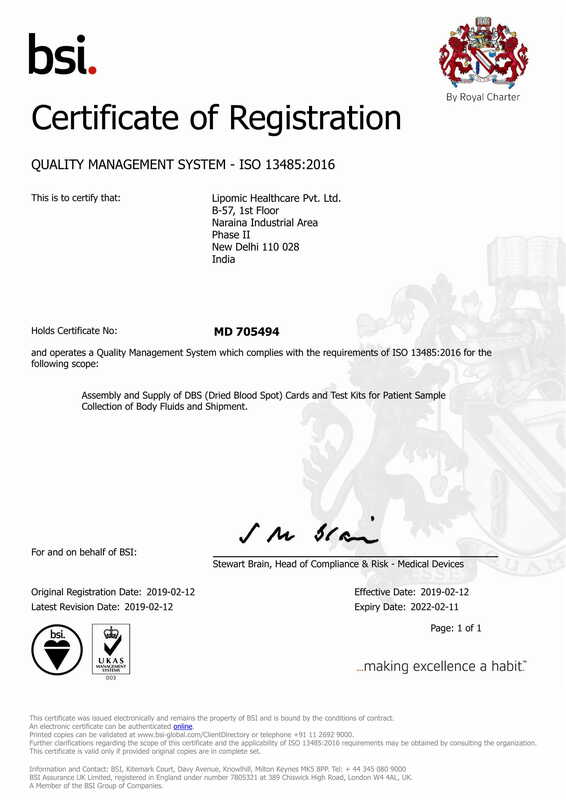 Lipomic’s certification applies to the manufacturing and assembly of dried blood spot (DBS) cards. Lipomic Healthcare has emerged as a global leader in manufacturing and sales of DBS cards and DBS kits for various application and has gained clients from across the globe including the US, Canada, Australia, Sweden, Norway, Vietnam and India. Its list of clients includes global leaders such as BASF. With its continuous focus on quality, LHC DBS kits are 510(k) exempted by the US FDA and is registered on the FURLS database (establishment registration nr: 3010771342) for sales in the USA.